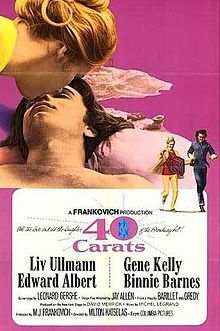 So I started with 40 Carats, which is a 1960s style farce about a woman who travels to Greece and meets a younger man, and has a one night stand. Then she goes back to the US and of course he turns up unexpectedly and all sorts of trouble ensues. Starring Liv Ullman, Edward Albert, and with an aging Gene Kelly. Sarah, LOVE this resource since I am always on the look-out for films set in Greece. Now to actually FIND some of these titles! (Sorry I put an h at the end of your name!) I just now found Shirley Valentine online and watched it. You had suggested it awhile back on a facebook conversation when I asked for ideas on Greek movies. I LOVED it. Thanks for the recommendation! You can pay a small fee to unlock it and watch it, for the next 48 hours, I think. Sounds like a Lifetime movie! Still fun to veg out to on a restful weekend!